Broken into three short stories of poetry and petty crime, this charming chapter book will have young readers in search of a rhyme in no time. Book 1 in the Marty Frye series! A Christy Ottaviano Book. Marty Frye is not your ordinary sleuth. Marty Frye is a poet detective--he makes up rhymes as he solves small crimes. When his friend Emma's diary is missing, Marty is on the Broken into three short stories of poetry and petty crime, this charming chapter book will have young readers in search of a rhyme in no time. Book 1 in the Marty Frye series! A Christy Ottaviano Book. Some people mention they recommend this book for middle grades, and some said younger readers. Would this be too old for a student entering second grade? Tashjian, Janet Marty Frye Private Eye: The Case of the Missing Action Figure & Other Mysteries, illustrated by Laurie Keller, 76 pages. Christy Oviano Books (Henry Holt), revised edition, 2017. $16. Language: G; Mature Content: G; Violence: G.
Marty Frye is a rhyming guy and also a private eye. 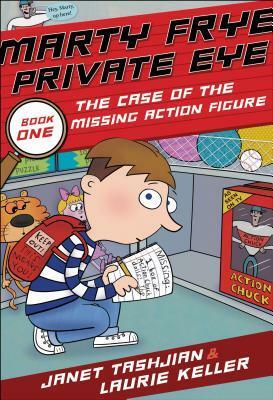 He solves three mysteries in this book, if you’d care to take a look: The Case of the Missing Diary, The Case of the Action Chuck, and The Case of the Mi Tashjian, Janet Marty Frye Private Eye: The Case of the Missing Action Figure & Other Mysteries, illustrated by Laurie Keller, 76 pages. Christy Oviano Books (Henry Holt), revised edition, 2017. $16. Language: G; Mature Content: G; Violence: G.
Marty Frye is a rhyming guy and also a private eye. He solves three mysteries in this book, if you’d care to take a look: The Case of the Missing Diary, The Case of the Action Chuck, and The Case of the Mixed-Up Flour. Marty Frye searches for clues and makes a list of suspects for each mystery. He makes a few mistakes, but in the end he always solves the mystery. Solving crimes with rhymes is an excellent combination. Author Janet Tashjian makes Marty Frye both likable and smart (and obviously a good rhymer). The illustrations in the book are expressive and eye-catching; and sure to catch the imagination of early chapter book readers. The format combines cartoon word blurbs, pictures, and formal text to tell the story and they work seamlessly together. If kids are interesting in catching crooks, they should try out these rhyming books. A beginner's chapter book about a boy who loves solving mysteries almost as much as he enjoys reading poetry and speaking in rhyme. This realistic fiction story does not stray from the reality of a young boy playing detective, there are no real bad guys, just situations that are misunderstandings Marty straightens out. Chapters are short, with large font, and illustrations to help readers further understand and construct meaning. I found this book to be a very fun story and would highly recommend any middle grader to read it! Be sure to check out my full review on my blog! A cute, clever set of short mysteries in rhyme. There are 3 mysteries and a preview of the 4th, which is in the next book. The rhyming adds to the story and makes it more fun. The children in my daughter's classroom will get to definitely enjoy it next week when I donate it to her. Adorable early chapter perfect for first and second grade readers. I especially enjoyed the rhymes. The rhyming is an interesting approach to writing a chapter book. Fun mystery for students beginning to read chapter books. Marty is a detective who loves poetry and rhymes while solving his cases. Recommended for grades 1 &up. A great first mystery to introduce the genre to younger students! An entertaining beginning chapter book consisting of 3 different mysteries. Marty is a rhyming detective who helps a classmate, a shop owner, and his sister. Great illustrations elevate the text. This book is about a young boy named Marty Frye who solves fun mysterys by using poetry. He solves two mystrys in this book, the first is a missing diry and the second is his sisters missing flour. I like how the book is easy and fun to read. The mysterys are clever and funny. Young children would enjoy this book. I think they could relate to Marty and the things he does at school and at home.